Even though several new sealcoat products claim to be coal tar free and environmentally friendly, they still contain ingredients that are harmful to human health and the environment. Due to this, the Van Buren Township of Michigan and other government agencies are ushering in new pavement regulations to ban all products that exceed certain levels of polycyclic aromatic hydrocarbons (PAHs). PAHs are chemicals formed from incomplete burning of organic materials such as coal, oil, and gas. Various harmful PAHs can be found in substances such as coal tar, roofing tar and some sealcoat products, several are carcinogenic and known to cause serious health risks. Exposure to PAHs can occur though skin contact, inhalation and ingestion of contaminated water runoff. Many of these new sealcoat products contain steam cracked asphalt or heavy pyrolysis oil (HPO) which contains high levels of toxic PAH. These new products may claim to have all the benefits of a coal tar free, asphalt emulsion sealer, but fail to mention that they contain 400 times more PAH’s. The graphic below utilizes the height of known structures to illustrate the levels of PAH in various sealcoat options. For example, the One World Trade Center is the highest at 1,776 feet tall and represents the concentration of PAH in coal tar pavement sealers. The St. Louis Gateway Arch represents new cracked asphalt sealers with HPO and high concentrations of PAH, the two-story house represents the European Union standard for toxic pavement, and the small dollhouse represents traditional asphalt-based pavement sealers. According to the Environmental Protection Agency (EPA), sealcoat products made with high levels of PAH such as HPO’s are of environmental concern because they are toxic, carcinogenic, mutagenic, and teratogenic to aquatic life and threaten public water supplies from rain and runoff. Exposure to fumes when applied can also be a dangerous health hazard and harmful indoor air and dust can be accumulated when tracked inside from children playing on these surfaces. GuardTop® has always been, and will always be, free of harmful PAH. 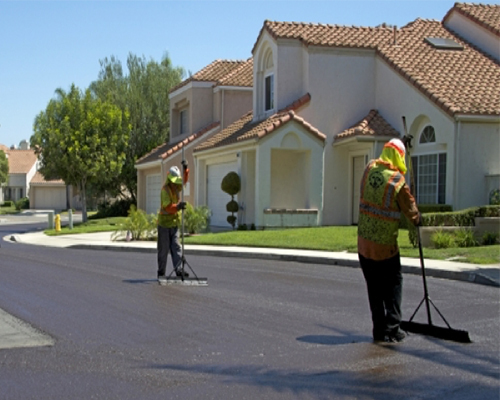 Our products are made from 100 percent asphalt base stock and are completely coal tar free and environmentally sustainable. GuardTop is a safer and cleaner alternative to harmful, toxic sealcoat products. GuardTop’s sealcoats have been rigorously tested and the results are available for public viewing. Coal Tar Free America. 2015. New sealer alternatives aren’t all they’re cracked up to be.